The problem with trying to write a satire of Florida politics is that Florida politics is so crazy that it's almost impossible to satirize. How could you top the butterfly ballot, the hanging chads, the press conference where Secretary of State Katherine Harris ran away from the reporters? So give S.V. Date a thumbs-up for trying to do the impossible, at least in the first half of this novel.Date, a one-time Tallahasse reporter who's written biographies of Bob Graham and Jeb Bush, sets up an intriguing situation that will sound familiar to longtime Florida residents. The incumbent Democratic governor has hit the end of his two terms in office, so he can't run again. His lieutenant governor is seeking to replace him, but he's a dull campaigner. The Republican Party nomination initially seems to belong to a maverick state comptroller who's retired military, but he falls overboard in a boating accident and so they need a replacement. They find the perfect one in Bub Billings, the folksy son of another former governor and the self-styled Lawn Furniture King of South Florida. Bub is no genius but he's got a way of connecting with the common people that's lacking in his smarter and more ambitious brother, Percy, and the resemblance to any brothers named Bush is entirely intentional.What sets the plot in motion is that Bub gives the wrong answer to a question about offshore drilling and thus incurs the wrath of the petroleum company executive who's bankrolling the campaign in exchange for the chance to sink wells all around the Florida coast. Bub conveniently falls off a boat too, and Percy gets his long-desired shot at the governor's mansion. What nobody realizes at first is that Bub is alive, rescued from the briny deep by a campaign consultant working for the Democrat who had been following the boat trying to get dirt on the GOP nominee.It's great set-up, but unfortunately Date doesn't do nearly as much with it as he could. He concocts a "boll weevil ballot" in Palm Beach County. The secretary of state is a Harris clone named Clarissa Highstreet, who is obsessed with plastic surgery and becoming ambassador to France, in that order -- and she doesn't understand what's wrong with clumping around the GOP chairman's yacht in a pair of high heels that repeatedly poke holes in the teak deck. That's about it for the humor in this book (well, that and the way he chooses to dispose of one of the characters). Instead, we get an extended chase scene that turns into a 100-page sailing competition as the GOP chairman and the oil company exec pursue Bub, his rescuer and a couple of allies back and forth in the Atlantic Ocean. Date is an avid sailor, but readers who pick up this book aren't looking for "Horatio Hornblower" -- and instead might be better served by the far, far funnier Florida political satire "Orange Crush" by Tim Dorsey. If you’ve devoured Carl Hiaasen, completed Laurence Shames, and run out of Tim Dorsey’s, you may want to give Date (Dah-tay) a try. 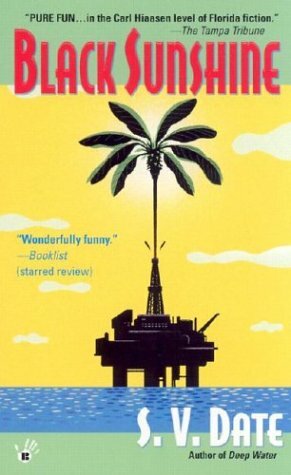 Like Hiaasen a former journalist with the Miami Herald, Date's books aren't quite as offbeat as Hiaasen's or as insane as Dorsey's, but still, he knows Florida every bit as well as they do and manages to capture it in all its zaniness.This one has to do with oil off Florida's coast and a Florida governor's race involving two brothers who are light caricatures of Jeb and George W. Bush. If you remember (or just want to relive) the insanity of the 2000 Florida presidential recount, you'll also find inside a thinly veiled yet hilariously on-the-nose portrait of Florida's then Secretary of State, Katherine Harris.I discovered Date with his book Smokeout and then went to look for all his others so I could catch up. Funny thing though, his very first effort (titled Final Orbit) was difficult to find. I eventually snagged a copy on ebay, and when I received it, learned it wasn't a whimsical or humorous tale, but a somewhat middling attempt at a thriller.What I most remember about it was that it had to do with intrigue aboard the space shuttle Columbia, and among its final scenes was the shuttle breaking up as it comes in for a landing. Always amazes me when fiction predicts the future. Happens far more often than you'd think. I enjoyed it because it takes place in Florida and on the water and the unusual characters.